A small crowd is lined up at Burnham Beeches; each visitor holds a story or a memory connected to this special place. A mother and her son stand behind me in the queue where we exchange excitement. We both admit that we’d tried to break in over the years with little success, and share the thrill at finally being invited in. The old building has lived many lives since its construction in 1933: first as a home to the co-founder of Aspro (the first large-scale distribution company of aspirin), then a children’s hospital during the war, a research facility and finally a hotel, before boarding up its windows and doors in 1991. For over twenty-five years, the house stood lonely above the Alfred Nicholas Gardens, perched among fern fronds and gum trees, and lined with a worn mental fence to keep intruders at bay. Burnham Beeches seemed forgotten, a shell of times passed, looming over guests to the gardens as they craned their necks in curiosity. Ears pricked when Tyrone Wright, better known as street artist Rone, announced that his latest work, Empire, was an immersive experience in the long-abandoned space. 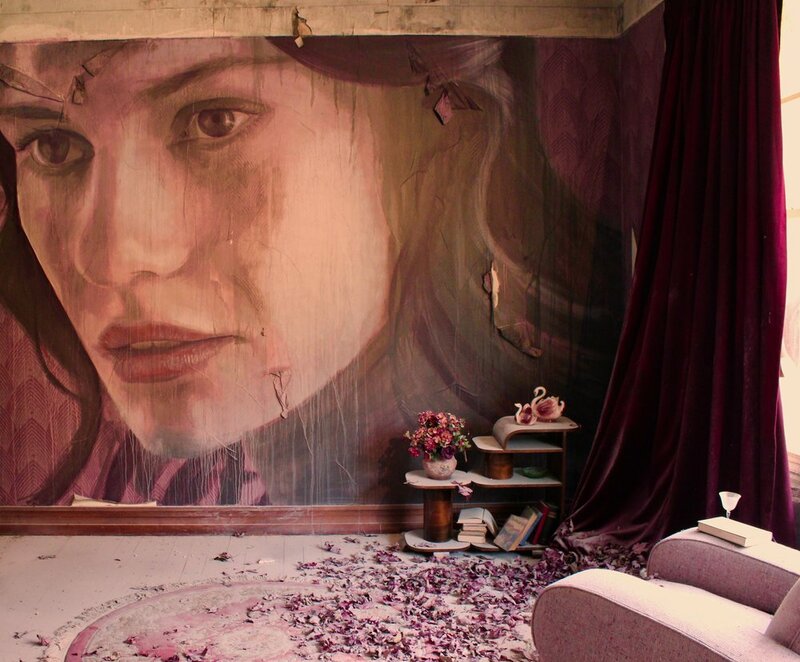 Rone’s work on the mansion spanned a year, installing everything with meticulous detail and creating a living landscape where guests can see the ghosts from an imagined past. The exhibition presents an empire in decay, a fabricated legend of great rulers that once inhabited this space. Yet their destruction and absence have left it a shell of itself; it sits unaware of the empire’s demise. Each room hosts a different season: autumn leaves crunch beneath our feet in the drawing room, the smell of dust and sunshine lingers within the reeds of the pool room, the darkness of winter descends upstairs and the soft light of spring fills the bedrooms. The wallpaper peels out, reaching towards us as we wander through in awe. Everything here is tenuously suspended in time: cobwebs wrap cocktail glasses, desks sheathed in dust, sheet music scattered in scraps on the floorboards that creak beneath us. Portraits of women line the walls of every room. Their features are soft in gentle reds, blues, greys—a shadow of elegance and youth cast in paint. The overlay of drips slipping down weathers the artwork; the walls weep at the destruction of time. This house exists in a cognitive dissonance, brought to life after decades of dormancy, yet still abeyant in the atmosphere so expertly crafted by Rone. The table in the dining room is cluttered with ornaments and silverware. Candles are lit in the fireplace. Sheet music leans from the piano stand. Despite the dust encasing each object, it feels as if the rulers of this empire didn’t know of their demise. The space sat lonely, and watched time erode it and nature break in. Shrubs grow through the light on the pool table. Crumbling roses scatter the floors of the upstairs and water fills the library, leaving guests to peer through the windows outside. An armchair and a desk, half swallowed by the black abyss. Empire will last two months at Burnham Beeches. The rumoured plans are for another hotel, a next life, but there are no dates attached and the project has received heavy objection from locals. It’s more likely the space will sit empty and forgotten again for another few years. 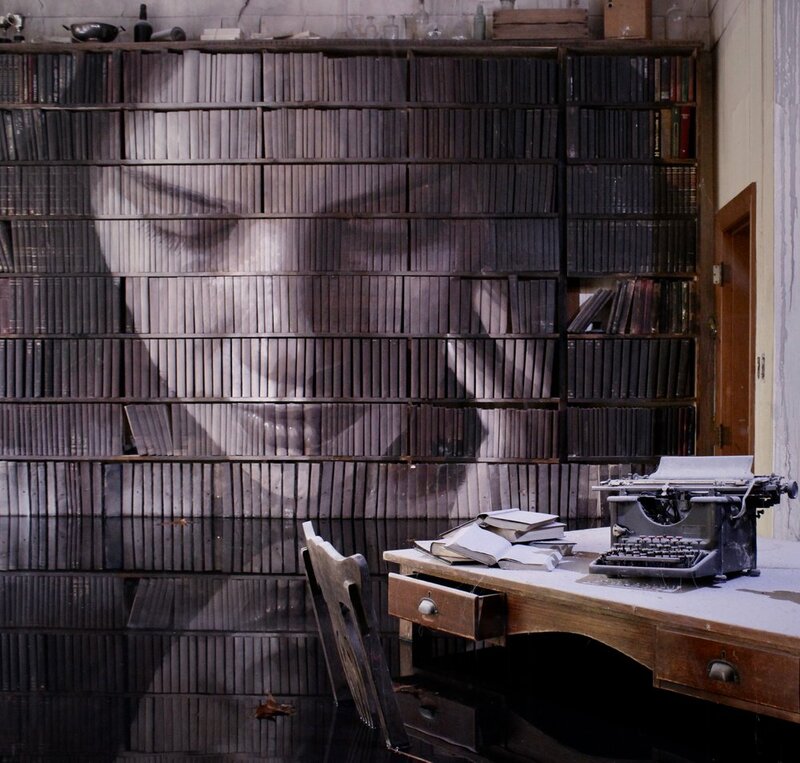 Rone is no stranger to the destruction of his work; his last two exhibitions were held in buildings set for demolition. He longs for the same kind of suspension he has created with Empire. His works embody the impermanence that beauty holds, the decay of time. Leaving Empire feels like waking from a dream. Wandering through the final hallway, guests can catch glimpses of the untouched rooms by peeking through small holes drilled into boards that cover the doorways. The layers peel back and the light of reality seeps through in small doses, acclimatising us. Outside I’m left slightly shaken. I’m holding postcards, a catalogue and a vinyl record: small tokens to try and sample the gravity of this place. I wander back to the bus stop in a daze, caught between satisfaction and wanting more. The public is crying out for the exhibition’s extension, but the point would be lost. The beauty of Empire is in its impermanence. It’s an echo of the past, sitting in a long-neglected garden for two months until the boards are sealed again and the public is left wondering. Empire runs until the 22nd of April in the old Burnham Beeches manor at the Alfred Nicholas Gardens. The exhibition is sold out but public pressure remains to extend the life of this incredible installation. This piece was produced by Sam McDonald. Sam likes hiking, nature, poetry, the beach and other clichés. She’s currently doing postgrad at the University of Melbourne, but between her classes she finds the time to pet the neighbourhood cats, watch copious amounts of television and continue her search for Melbourne’s best bagels.